I'm so done with my same old clothes. Every time I look in the closet I give them all the stink eye. I feel like I've been staring at the same sets of pants, shirts and skirts for forever and a day. My closet is full of things I try to make myself wear, but don't. Truth be told, I feel like I rotate about 25% of my closet. I'm not proud. I decided to take charge of my wardrobe and start putting some things in my closet that I actually want to wear. 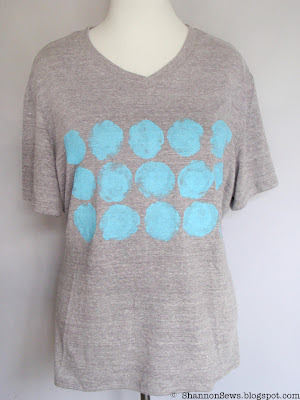 Enter: Refashioned painted t-shirt. 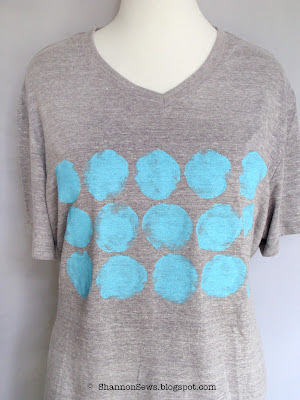 I call it Dots. I love wearing t-shirts. Fancy t-shirts. This one started as an oversized men's t-shirt that I re-sized to fit me, while giving it a little personal flair. 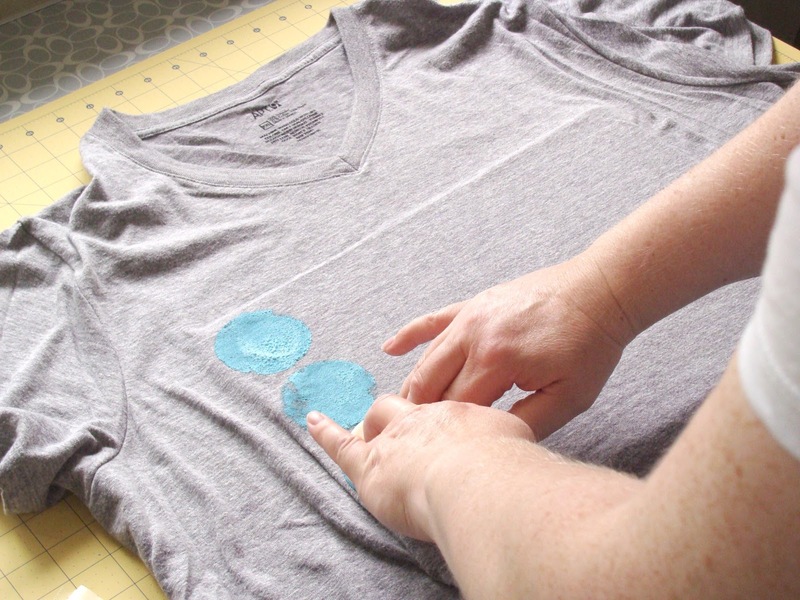 Want to decorate your own t-shirt with a little imagination and fabric paint? 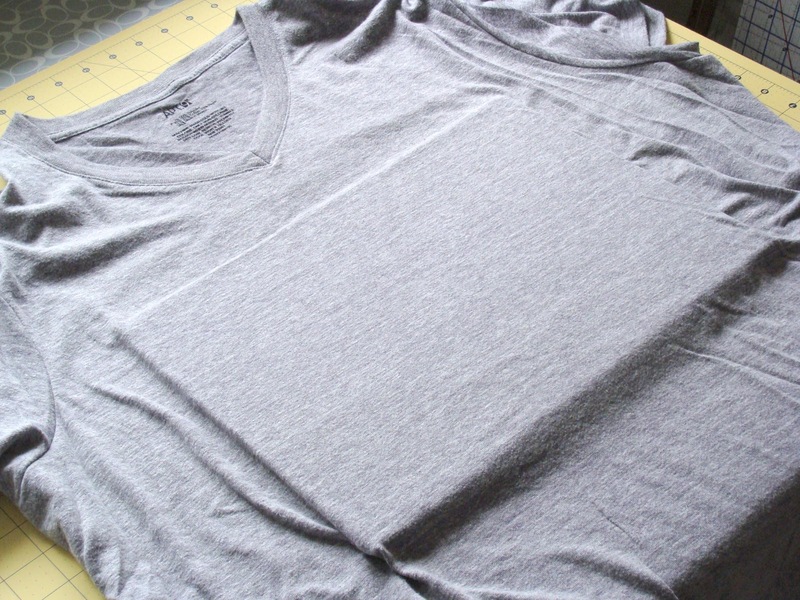 I started with 1 gray, v-neck clearance rack t-shirt. Don't you love it when you find a fab deal? This t-shirt was only $3.99. So I bought 2 and saved the other for my key designed t-shirt. I used SoSoft fabric paint, in Indian Turquoise. I'm a sucker for turquoise and I LOVE SoSoft fabric paint. It leaves a soft, flexible feel, unlike many cheaper fabric paints. 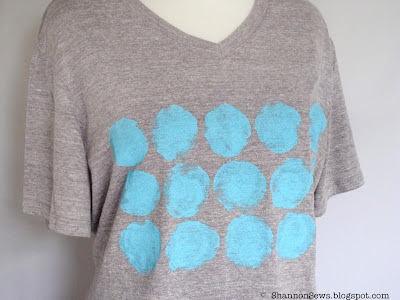 You'll also need a piece of cardboard, a sponge (I used a round sponge because I wanted to make dots), and a piece of wax paper or something else to place the paint. Slip the cardboard under the shirt where you want it. 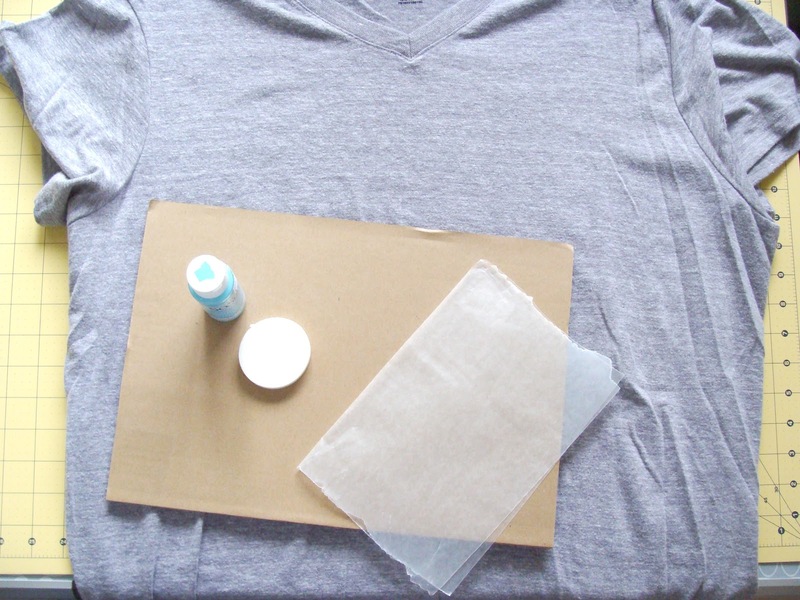 I lifted the shirt up and sprayed a dash of spray adhesive to the cardboard to keep it in place. 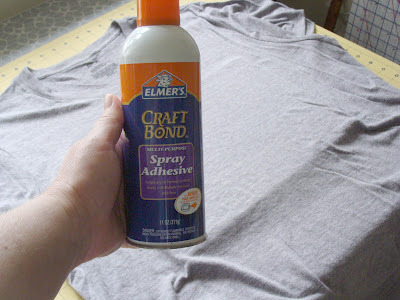 I didn't want the shirt to lift up when I applied my paint. Here it is sprayed and in place. 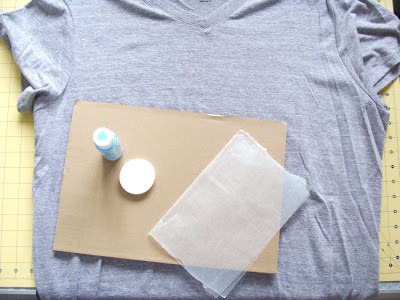 I used the wax paper for my paint station. In order to make sure the dots would fit the area of the rectangle, I first mapped it out with the dry sponge. 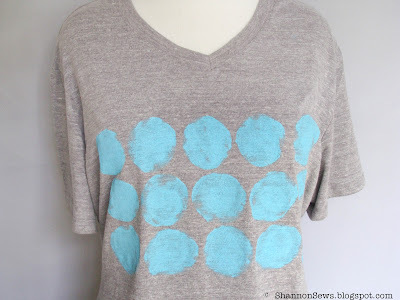 I pressed one side of the sponge into the paint, and pressed it down on the shirt. 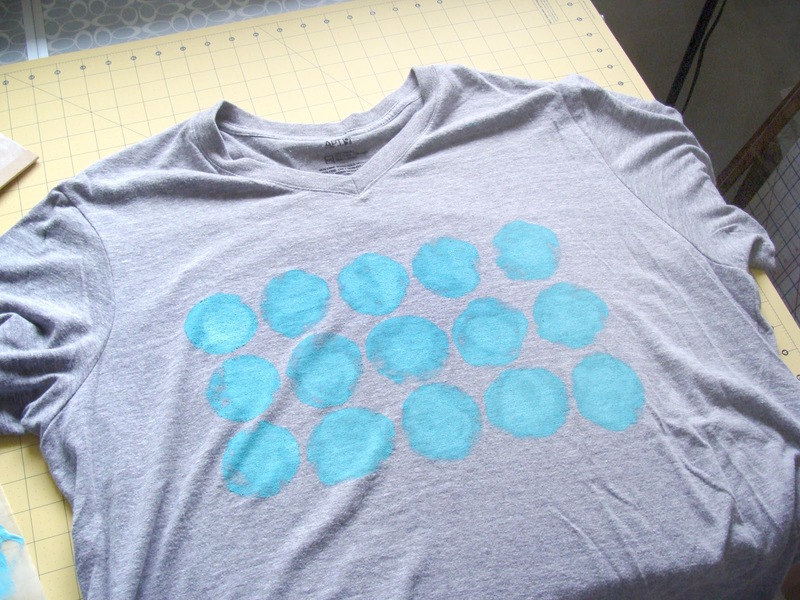 *Note: sponges do what they do best, soak stuff up, so make sure you have more than enough paint. I was willing the sponge to squeak out what paint was left by the time I made the last dot. Eeek! Tada! Just like I hoped it would be. 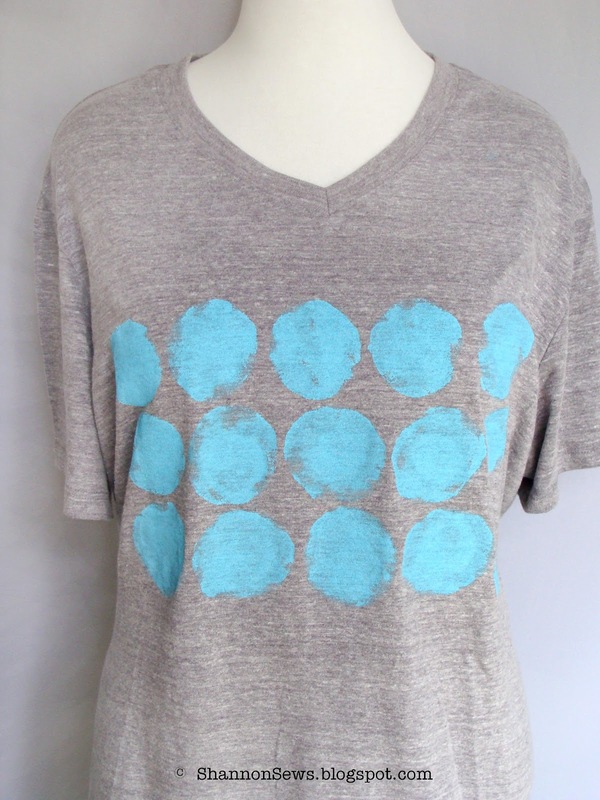 Lovely handmade turquoise dots. 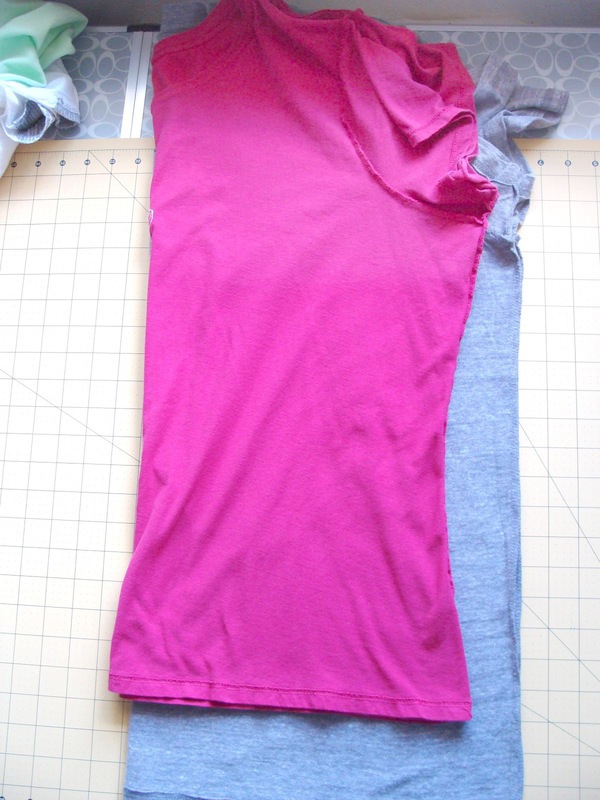 The easiest way for me to make a big t-shirt smaller, without taking off and re-sizing the sleeves, was to fold both shirts in half and lay one of my t-shirts on top of it. 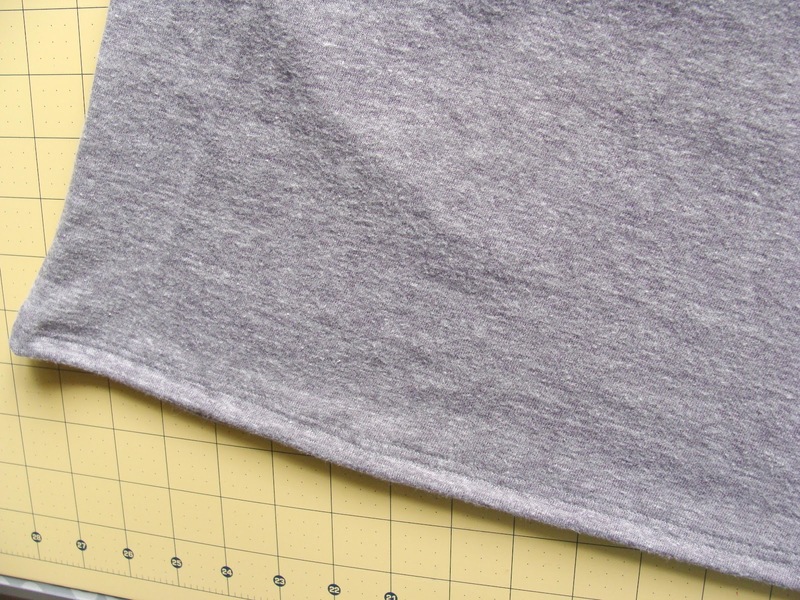 I cut the men's shirt to the outline of my t-shirt, making sure to leave room for seam allowance. 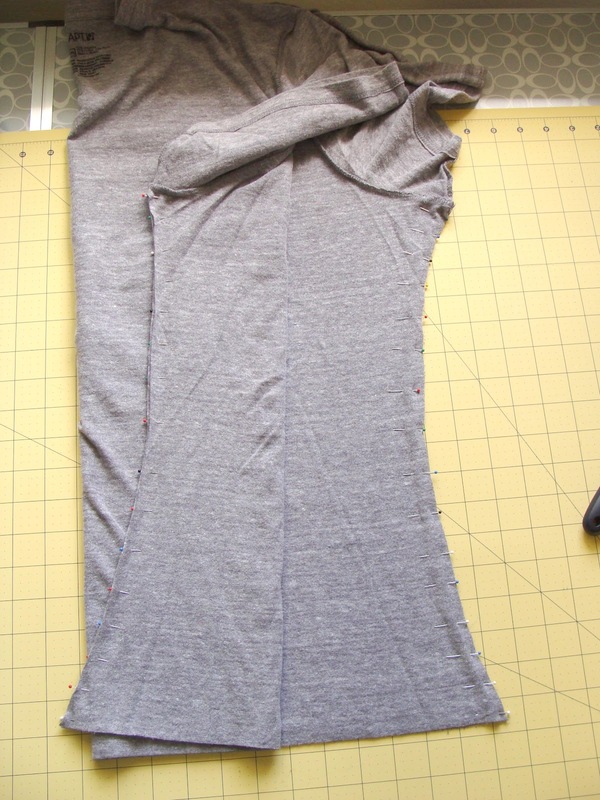 Jersey can be tricky to work with, as it stretches easily and raw edges like to roll under (grrrr!). 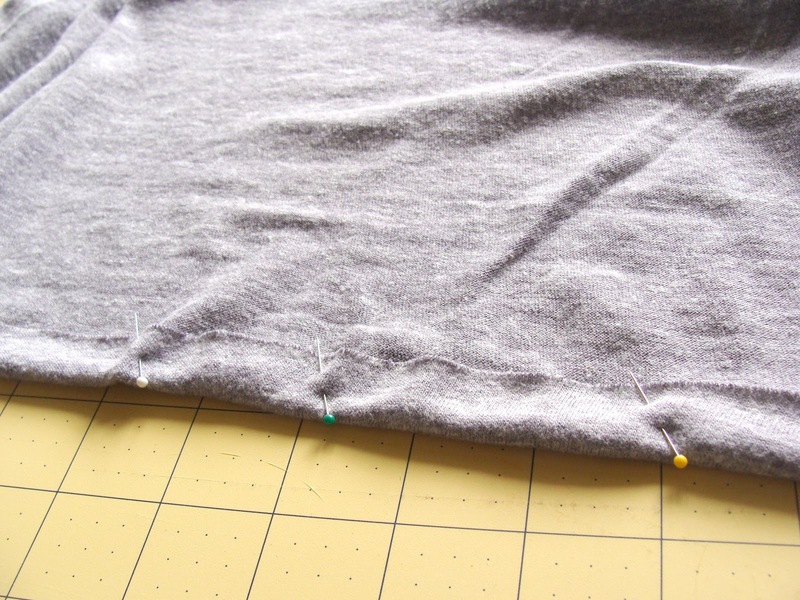 Try not to move the shirt again until you have pinned it together. I put my sewing ruler carefully under the first layer, so I could pin one side. 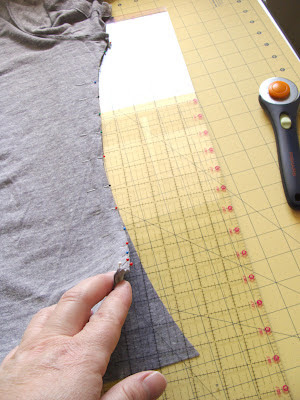 I removed the ruler and pinned the other side, against the cutting mat. No jersey movement. Success! I started sewing from an existing stitch under the arm, and continued down. 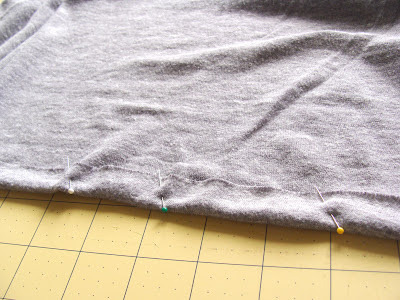 *I always use a ball point needle when sewing jersey, so as not to make holes in the fabric. For the hemline of the shirt, I just folded it under about an inch, and pinned. 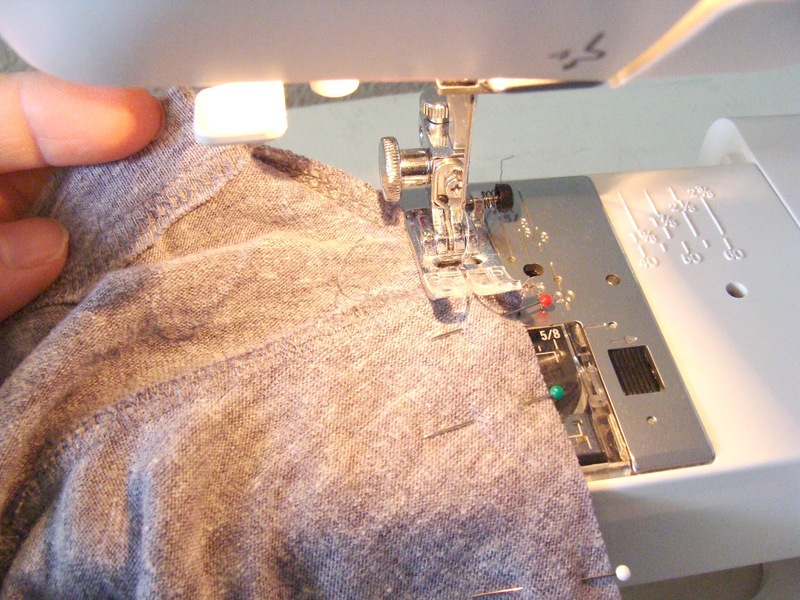 I like to use a double stitch along the hemline, as is common with t-shirts. 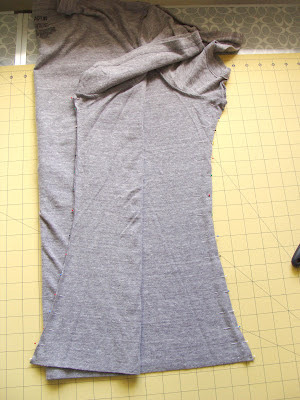 If I had a ball point double needle I would have used it, but instead I just made 2 parallel stitches along the hemline. 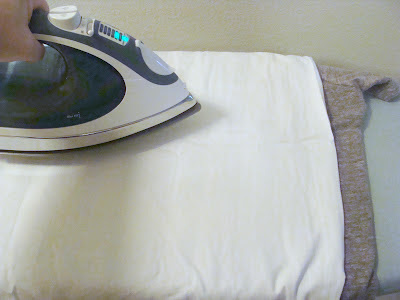 Use a dry iron = no steam. Empty water &/or turn off the steam setting. 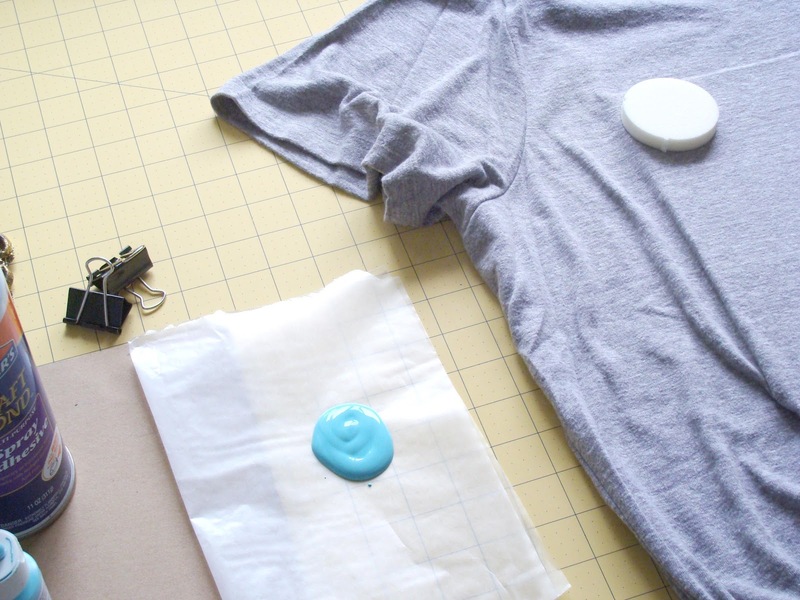 *Depending on what your shirt is made of (*read t-shirt label. 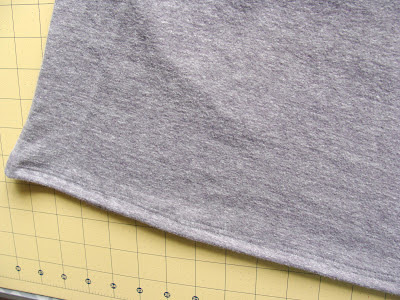 Some blends can't be set on hot or it will melt the fibers; cotton can generally take hot) set iron on med to hot setting. 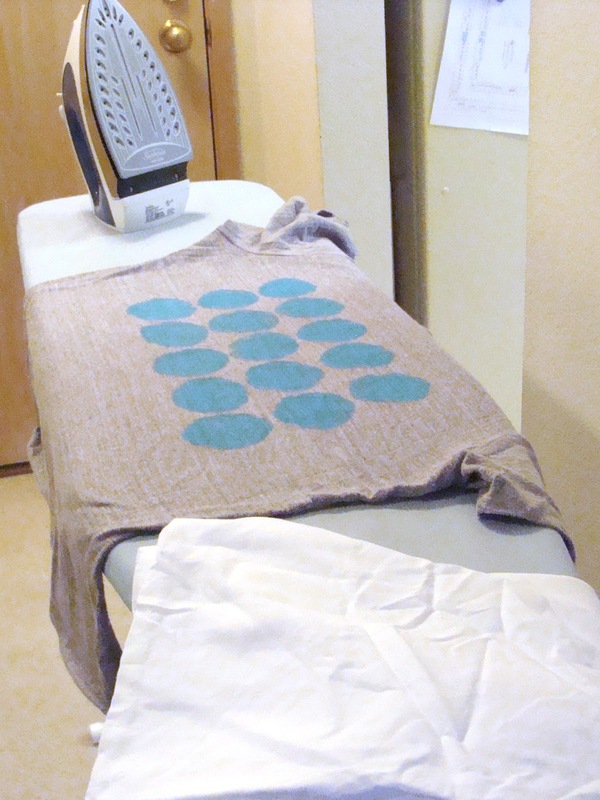 Turn the shirt inside out, or use a cover sheet like an old clean pillow case, or sack cloth non-fiber towel. 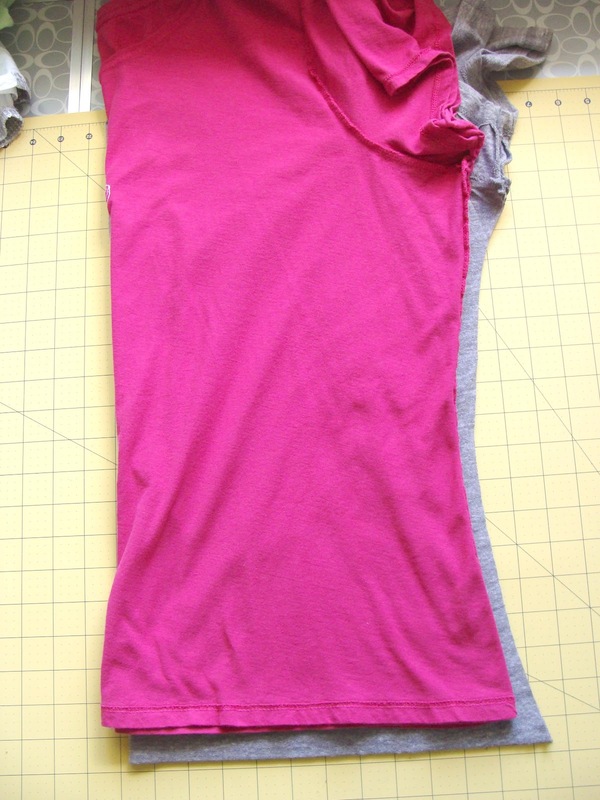 The shirt will get nice and hot, so be careful. 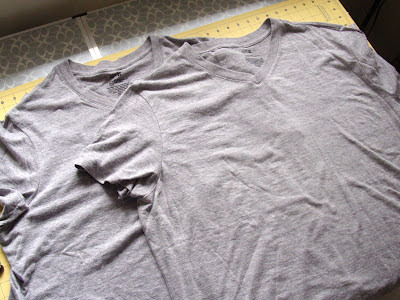 Don't wash shirt for about 4 days after paint application, for longer durability. I love the turquoise and gray together along with the hand painted look of the dots. i love the color combo you chose-- very pretty. 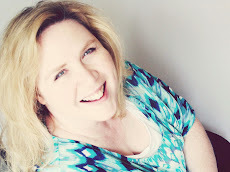 and you are so smart about slimming down men's shirts. I've saved some of jeremy's old plaid shirts that i've wanted to "slim" down to womanly size for myself. Thanks Em! 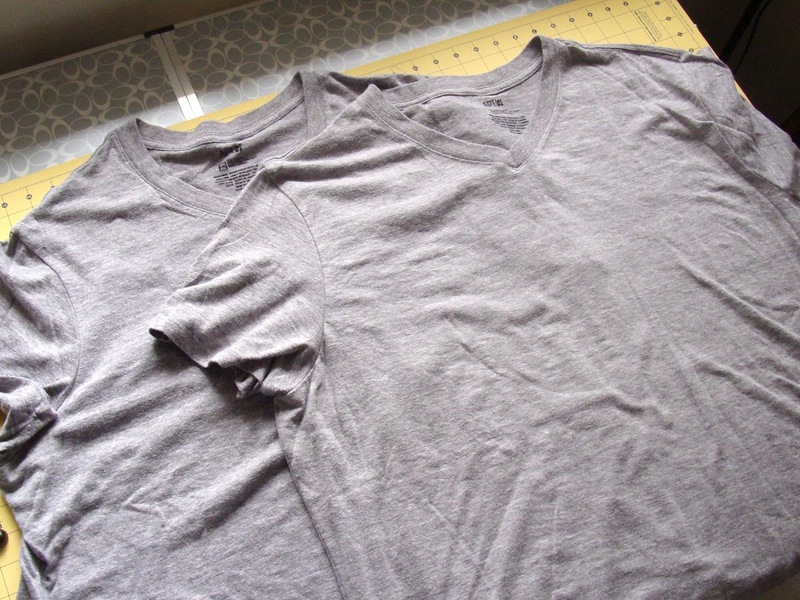 Slimming shirts down is so easy - glad you're saving some of Jeremy's to try it on! This is really cool. Great idea! Thanks for the great tutorial! I was intimidated to try slimming up big shirts for fear I'd mess it up, but surprisingly, it's easier than I thought! Thanks for stopping by! Thanks for stopping by Kathy! Just joined your site as well. Always looking for fun new people to meet. Thanks Erin! I finally went through my closet and took out some of the worst offenders. hahaha Now I'll actually only be seeing the 25% of my wardrobe I rotate anyway! Nice designs & creativity, thanks for sharing.